One of the most powerful time saving features of Codisto is the Multi Edit feature of XpressGrid. In the left column of XpressGrid you will find a check box. When ticked, the product is selected. XpressGrid Multi Edit is active as soon as 2 or more products are ticked. Once Multi Edit is activated, each column has a multi edit control as shown below. Edits made via these controls will update all the selected listings with the information entered. Clicking the check box in the header row will select all products if no filter is applied otherwise only the filter results are selected. 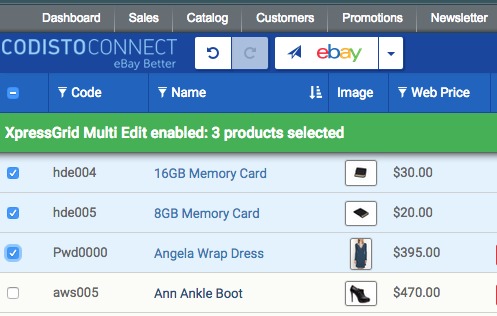 This makes it very easy to update many products matching certain criteria at the same time.